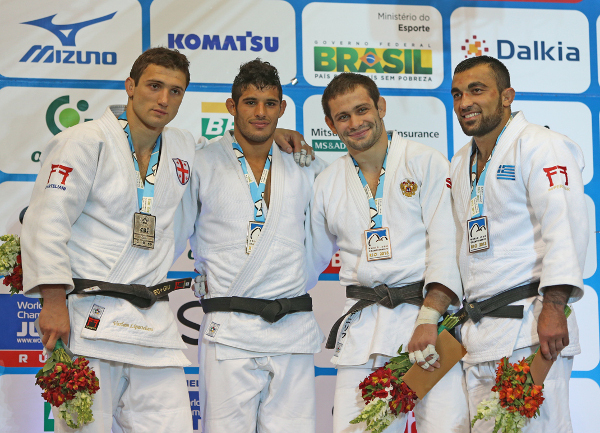 The 2013 World Championships continued to be the talk of the sporting world as Rio de Janeiro came alive once again with judo fever at the Maracanazinho on Friday. Three world champions were crowned on day five as the women’s -70kg and -78kg judoka took to the tatami along with the men’s –90kg judoka. The expectant crowd saw 62 women and 62 men compete with the stars of the World Judo Tour vying for the greatest annual prize in the sport. Day five proved to be a day of surprises as the top seeds fell and two judoka won their first senior world titles while one added a second to her impressive record. There was an emotional farewell for Olympic champion Lucie DECOSSE (FRA) who brought her career to an end in Rio. The French all-time great and three-time senior world champion was unable to secure a fairytale swansong despite a tenacious effort as the 32-year-old finished in fifth-place. DECOSSE took an age to the leave the tatami after losing the bronze medal contest as the reality set in that she had graced the tatami for the last time in a career where she become a superstar in the sport. After leaving the competition tatami for the final time, DECOSSE entered the mixed zone and told the media: “By finishing in fifth-place everybody is looking at me like I won as everybody is crying. It was a really emotional day for me. At the same time I’m still a competitor, I’m going home without a medal and I don’t like it. Brazilian hopefuls Eduardo SANTOS (BRA), who replaced the injured 2007 world champion Tiago CAMILO (BRA), and former Pan American champion Maria PORTELA missed out on home success while Olympic bronze medallist came to the fore as she won bronze. After five days of competition, Japan – with six medals including three gold - maintain top place on the medal podium despite missing out on a medal today. France are second with six medals including one gold while hosts Brazil are well-placed in third with four medals including one gold. 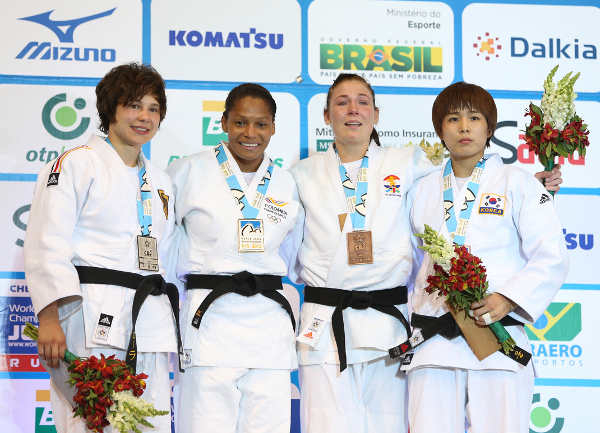 Olympic bronze medallist and 2009 world champion Yuri ALVEAR (COL) starred for Colombia as she defeated European bronze medallist Laura VARGAS KOCH (GER) in the -70kg final. ALVEAR got better as the day went on and was firmly in control in the world title decider as she went ahead with a yuko from an uki-goshi and followed up to take the victory by ippon from an o-goshi. ALVEAR, who edged out DECOSSE in the quarter final, booked her place in the final by blasting her way past four-time Asian champion HWANG Ye-Sul (KOR) with a hane-goshi giving her a third yuko – to add to her earlier waza-ari – and eased into osaekomi-waza as she applied a tate-shiho-gatame for ippon. VARGAS KOCH ensured a second defeat for South Korea in the semi-final as she bested Ulaanbaatar Grand Prix winner KIM Seongyeon (KOR) in golden score as she countered a ura-nage attempt for a yuko score. The first bronze medal was won by Kim POLLING (NED) in 34 seconds as she let out some of her frustrations from losing her quarter-final against KIM. The European champion dismissed HWANG, the teammate of KIM, with a ura-nage for waza-ari and then a mune-gatame sealed the win. 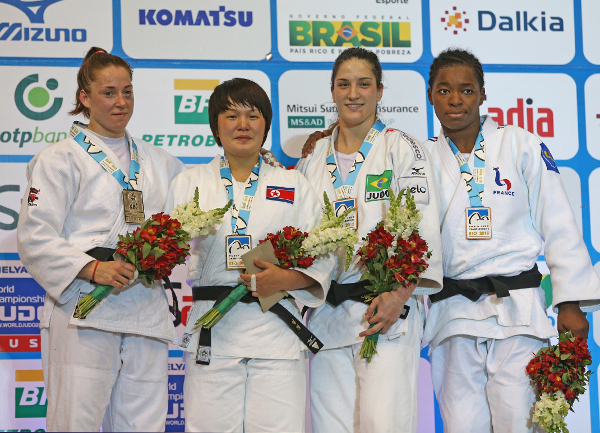 The second bronze medal was won by KIM who will go down as the last judoka to defeat the retiring DECOSSE. To fight for bronze the French legend edged out home judoka Maria PORTELA (BRA) in an epic repechage contest with was decided with an o-soto-gari earning ippon after four absorbing minutes of golden score. KIM made a blistering start as she scored a yuko after just 12 seconds from a drop deoi-nage and, while they exchanged shido penalties for passivity, there was no further action on the scoreboard as 2010 Junior world bronze medallist KIM celebrated a career-best result. World number two Kelita ZUPANANCIC (CAN) was left to rue an early exit as she was beaten by HWANG in the preliminary rounds. Asian Championship silver medallist SOL Kyong (PRK) was crowned world champion for the People’s Republic of Korea as she overcame 2009 world champion Marhinde VERKERK (NED). SOL won her country’s first medal of the competition as the unexpected yet richly-deserving finalist defeated European championship bronze medallist VERKERK with a drop seoi-nage earning a waza-ari and settling the contest after five minutes. In the semi-final SOL defeated seven-time Pan American medallist Catherine ROBERGE (CAN) by ippon after three minutes while at the same stage VERKERK shaded a test of wills against former Pan American champion Kaliema ANTOMARCHI (CUB) by a yuko. The first bronze medal was won by World Judo Masters winner and Olympic bronze medallist Mayra AGUIAR (BRA) who triumphed against ROBERGE to the delight of the home crowd. The 22-year-old repeated her 2011 World Championships bronze medal as a harai-goshi was awarded ippon with a minute remaining in the contest.The second bronze medal was won by 2011 world champion and Olympic bronze medallist Audrey TCHEUMEO (FRA) who bested ANTOMARCHI for the final spot on the -78kg medal podium. TCHEUMEO powered forward to earn a yuko from a ko-uchi-gari and was then penalised for manoeuvring away from attacks by going outside the competition area. World number two Abigel JOO (HUN) was upset in her opening contest by eventual winner SOL. Olympic silver medallist and 2011 World Championship bronze medallist Asley GONZALEZ (CUB) defeated world number one Varlam LIPARTELIANI (GEO) in the -90kg final. There was nothing between the top two judoka on the -90kg world ranking list. LIPARTELIANI was penalised first for passivity and seconds later offended again for the same offence. GONZALEZ, who had the backing of the Brazilian fans, was penalised with a shido for a false attack and the five minutes elapsed to see GONZALEZ crowned world champion. In the semi-final GONZALEZ defeated double world champion and former Olympic champion Ilias ILIADIS (GRE) after 48 seconds of golden score action with a morote-seoi-nage attempt earning a yuko. At the same stage LIPARTELIANI marched past world number four Kirill DENISOV (RUS) in 88 seconds as two uchi-mata throws both earned waza-ari and ultimately wazari-awasette-ippon. The first bronze medal was won by ILIADIS who ended the medal hopes of the eye-catching former European u23 Championships bronze medallist Joakim DVARBY (SWE). The Greek superstar went ahead as a sode-tsurikomi-goshi received a yuko and with 39 seconds left ILIADIS served up a spectacular o-goshi for ippon. The second bronze medal was won by DENISOV who countered an attack from 19-year-old Krisztian TOTH (HUN), the former European u23 Championship winner, with a ko-soto-gake for ippon after just 33 seconds. The result saw DENISOV clinch Russia’s second medal of the competition after Ivan VOROBEV (RUS) won bronze on Thursday.